You are here: Home > HTC’s First Robert Downey Jr Full Length Ad Leaks Online, But Is It Any Good? HTC’s First Robert Downey Jr Full Length Ad Leaks Online, But Is It Any Good? Update: Moments after this post went live, HTC posted the full 2:02 commercial on their own YouTube page. HTC’s first Robert Downey Jr. (inspired?) commercial for the company’s recently announced “Change” campaign has leaked online. With the actors recent string of movie successes, I expected a real “wow” or “cool” factor with this $1 billion dollar campaign. Instead, all I have to say is…wut? Can someone explain to me how this is going to convince me to buy a HTC device? Don’t get me wrong, I get the inner meaning, that HTC is anything you want it to be. But Humongous Tinfoil Catamaran? Hold This Cat? Wut? 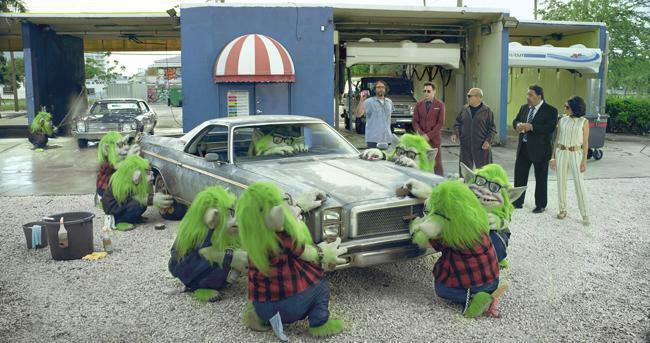 And what is going on with these green trolls? Will this ad Help Turn Company around? That’s seems unlikely and it’s unlikely this particular spot will boost HTC’s bottom line as green trolls aren’t likely to get people running out the door to buy a new smartphone. Still, it’s RDJ and I’m interested to see where HTC can go with this campaign. I just hope $1 billion dollars buys more than cats and green trolls, otherwise it’ll be Help This Company. Truly a “jumping the shark” moment. HTC needs to hire a new advertising agency. i fail to see the point of the ad. captain? HTC has officially lost to other OEMs when it comes to marketing. Good or bad, it is different which in marketing is good since it will cause more discussion, however they need to focus their marketing on their product. If you don’t know what the company sales you are less likely to buy their product. For a video, it’s fine, but it doesn’t help those who don’t know what HTC is all about, figure that out. This seems to be as effective as the BlackBerry Super Bowl ad, which is fine if your goal is to form a committee to review options to include putting your company up for sale. If your goal is to increase sales, then Hope Totally Ceased. I had to actually stop and look at some of the stuff at the end in slow motion. Hawaiian Tickle Ceremony?! Hungarian Tuba Concert?! I didn’t realize that there was a contest going on for the most pointless commercial. Personally, I enjoyed the commercial. I think its more of a commercial for HTC than for the HTC One. They’re showing that they’re going to change. Also, I think its somewhat effective in helping with the brand recognition – HTC. However, I think they need to utilize RDJ to get some good, high quality commercials specifically for the HTC One. If HTC wants to build back their brand loyalty, they need to SUPPORT THEIR OWN PRODUCT! Don’t just release 1 major update and call it good. They should be taking a page out of Samsung’s book and keep the phone alive for a couple years at least. Let the HTC One become the mid-tier phone next when the HTC Two is released like Samsung did with the SGSII. Makes me want to go out and buy an HTC phone. When I know, you’ll know! Who should of really left HTC months ago was the marketing sector! Horrible Trashy Commercials is what I’m seeing. So when does he turn into iron man? love Downey Jr. but this effort from HTC makes little sense .. obviously his involvement is purely money but at least make sense of it .. it does nothing to move me into buying anything HTC. I hate that you made me relive that commercial all over again. I had wiped it from my memory years ago. Keep Robert Downy, Jr. and fire the marketing team. They have a real talent and cool factor in him and do not need to waste it on senseless commerecials. What a stupid commercial. Made no sense. You can’t just throw a celebrity on the screen and expect it to be genius. Oh well, my next phone wasn’t going to be HTC anyway, so maybe I’m not their target audience.